Werner Heisenberg, a German physicist, was born Dec. 5, 1901. In February of 1927, Heisenberg (center figure in first image) wrote a letter to Wolfgang Pauli, an Austrian physicist (right in first image), in which he made a radical proposal. He suggested that it is impossible to know, at the same time, both the exact position and the precise momentum of a moving particle, such as an electron. Instead, there is a built-in uncertainty in these quantities, such that the product of the uncertainties is greater than a physical quantity h, called “Planck’s constant.” As a physicist would say it, delta p (the uncertainty in momentum) times delta q (the uncertainty in position) is greater than Planck’s constant. Or, as a physicist would write it, Δp · Δq > h.
This is now known as the Heisenberg uncertainty principle, and it is one of the cornerstones of quantum mechanics. It does not affect the measurement of quantities in ordinary life, since Planck’s constant is of the order of 10-34, i.e. it is very, very small. But at the scale of an atom, it makes a big difference; it means that if we know how fast an electron is moving, we don’t really have any idea where it is in the atom; all we can do is give the probability that we will find it at any particular location. And if we do know where it is, there is a great uncertainty in its momentum. This was the part of quantum theory that Einstein balked at, claiming that “God does not play dice with the world.” But Einstein was wrong–it is indeed a dicey world. Quantum theory was the subject of the Fifth Solvay Conference in Brussels, held just 8 months after Heisenberg sent his letter to Pauli. One imagines that the uncertainty principle was a major topic of discussion, and that Einstein was not at all happy. In the photo of the assembled participants (second image), Einstein has the place of honor in the center of the front row, while young Heisenberg is the third from the right in the back row, right next to Pauli, fourth from the right. 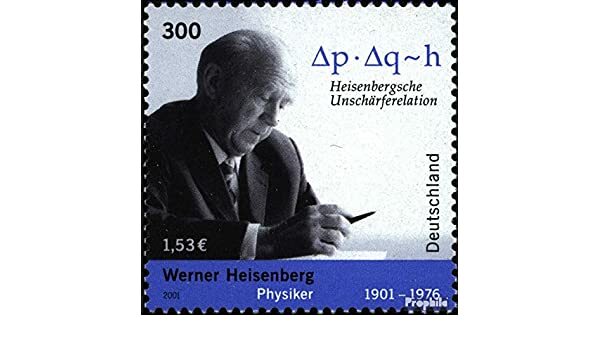 In 2001, Germany issued a postage stamp honoring Heisenberg, depicting him as an elder scientific statesman. The uncertainty equation has a prominent place on the stamp (third image).